but it retained the '52 three-piece rear. 4,700 were produced. 1953 DESOTO - GENERAL: This was the 25th anniversary for DeSoto, but no special models were offered. A new series, "Powermaster", debuted named to coincide with the L-Head Six it was named after. Gone were the DeLuxe and Custom. With this model, there were only two series, that and the Firedome. Also retired was the Suburban—a series that had no buyers now that station wagons and 4-door sedan taxis were popular. The 1953 DeSotos were similar in appearance to the 1952 car, yet the design had a major sheet metal revamp, but it was subtle and barely noticeable. It was much improved over the abrupt styling of 1952, but to most buyers, it went unnoticed. In a change, the front fender line extended front to rear and the back fenders were now integral with the body structure even though they bulged out at the front. The roof line now faded into the rear deck in a more pleasing fashion. Big news was the one-piece, curved windshield. The Club Coupe was now more Sportsman-like than the previous year's counterpart, boosting sales. Only the station wagon continued with 1952 fender styling. The Sportsman hardtop used the 1952 style roof structure with its three-piece rear window treatment, while the eight-passenger sedan used the 1952 body with the new one-piece curved windshield. The 1952 "toothy" grille added two more dentures, now at eleven. Side chrome was more evident as Korean War demands abated. INNOVATIONS: All DeSotos received a one-piece curved windshield, originally pioneered by Chrysler in 1934 on the Airflow. All except the Sportsman received a one piece curved rear window as well. 1953 POWERMASTER SERIES S18 (6-Cylinder): The Powermaster took the place of the Deluxe, and taking on the trim and interiors of that model line. The L-Head Six continued to be the only power plant. For identification purposes, the word "Powermaster" was on both front fenders and there was no additional chrome trim, unlike the Firedome. Standard equipment on Powermaster included dual sun visors, dual two-speed electric wipers, directional signals with parking brake light, cigar lighter, stainless steel trim rings, illuminated glove box with lock, dual outside door locks, map light, counter balanced luggage compartment lid, illuminated luggage compartment, right and left front door arm rests, interior door locks and bumper guards front and rear. 1953 FIREDOME SERIES S16 (8-Cylinder Hemi): The Firedome was the V-8 model and it shared most features of the six-cylinder Powermaster series. It offered the same six body styles that had been available in 1952. Highlights included brakes with 12-inch drums, Cyclebond brake linings, Oriflow shock absorbers, coil front springs, waterproof ignition, full length water jackets, full pressure lubrication, air vent hood and an improved frame designed to resist twisting. Changes from 1952 included new combination tail, stop and backup lights and a gas cap positioned below the deck lid on the left side on the rear fascia. The words "Fire-Dome V-8" appeared on both front fenders and the word "Eight" was attached on the right side of the rear fascia, below the deck lid. A chrome trim slash was placed on the front fenders of all Firedome models except the eight-passenger sedan and the station wagon. Standard equipment mirrored the Powermaster, however, the FireDome has upscale interior fabrics in some models. Powermaster serial numbers. Cars built in Detroit had serial numbers 50266001 to 50304981. Cars built in Los Angeles had serial numbers 6239001 to 62042345. Taxis had serial numbers 5124001 to 5125711. Motor numbers began with S18-1001. FireDome serial numbers. Cars built in Detroit had serial numbers 55050001 to 55127622. Cars built in Los Angeles had serial numbers 64008001 to 64015691. Motor numbers began with S16-1001 and were all built in Detroit and used at both assembly plants. Serial number codes were on the left front door hinge pillar post. Powermaster motor numbers were located on the left side of the block below cylinder head between first and second cylinders. FireDome V-8 engine numbers were positioned at the top of the engine block under the water outlet elbow. No code numbers were provided for positive identification of body style type. Powermaster Series I-6: L-Head. Cast iron block. Displacement: 250.6 cubic inches. Bore and stroke: 3.4375" x 4.5". Compression ratio: 7.0:1. Horsepower: 116 @ 3600 RPM. Torque: 209 @ 1600 RPM. Four main bearings. Solid valve lifters. Carburetor: Stromberg 380359 with M-6 transmission. Carter E9A1 all other powertrains. FireDome Series Hemi V-8: Overhead valves. Hemispherical combustion chambers. Displacement: 276.1 cubic inches. Bore and stroke: 3.626" x 3.344". Compression ratio: 7.1:1. Horsepower: 160 @ 4400 RPM. Torque: 250 @ 2000 RPM. Five main bearings. Hydraulic valve lifters. Carburetor: Carter two-barrel model 905S with standard transmission. All others: Carter two-barrel models 908S, 909S and 910S. Wheelbase: (Long wheelbase models) 139.5" (All others) 125.5". Overall length: Long wheelbase models - 224.625" Short wheelbase models 213.375", except Station Wagon 212.750". Tires: Long wheelbase - 8.20 x 15 All Others - 7.60 x 15. Powermaster 6: Three-speed manual transmission standard. Tip-Toe Shift with Fluid Drive optional. Tip Toe Shift with Fluid Drive. HISTORICAL BACKGROUND: The DeSoto Adventurer experimental show car was on the show circuit in 1953. Chrysler purchased the Briggs Manufacturing Company this year for $35,000,000. This was the 25th anniversary for DeSoto, but no special models were offered. PRODUCTION: 130,404 DeSotos were built in 1953, an increase of almost 33,000 over 1953. See attached chart for production numbers. The 1953 DeSoto Firedome Convertible looked a bit sharper for 1953. The result was a doubling of sales to 1,700. By 1953, the DeSoto Firedome 4-Door Sedan had caught up to their Olds and Mercury counterparts delivering 64,211 to their customers. As the 4-door, the 1953 DeSoto 2-door Club Coupe was closer in looks to its competition, and a bit ahead in power. The 1953 DeSoto Firedome 8-passenger sedan was still hanging in there, but with only 200 sold, it would only last for another year. The 1953 DeSoto Firedome Station Wagon was still not a large seller, moving 1100 units. The 1953 Powermaster 6 owners were happy that the Sportsman was available. Unfortunately, the sub-par performance of the 116 HP six did not entice many buyers. Only 1,470 were sold. The 1953 Powermaster 4-door was almost indistinguishable from its 8-cylinder counterpart. May were not put off by its tepid performance. The result was 33,644 deliveries. 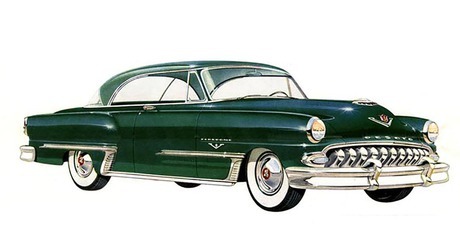 The 1953 Powermaster 8-passenger sedan was hard put to move spritely with only 116 HP. Regardless 225 were sold. 1953 DeSoto Powermaster 2-door Club Coupes sold well, with over 8,000 delivered. Surely the new, airy lines - emulating the Sportsman - helped. The 1953 Powermaster Station Wagon was not very popular – with only 500 produced. Perhaps it was the $3,093 base price - more than a Firedome Sportsman. Of all the subtle styling changes, it was the wrap-around front and rear windows that dramatically modernized the car. There were lots of subtle styling changes in the 1953 year. The arrows point them out as well as the differences between the Powermaster 6 and the FireDome 8.